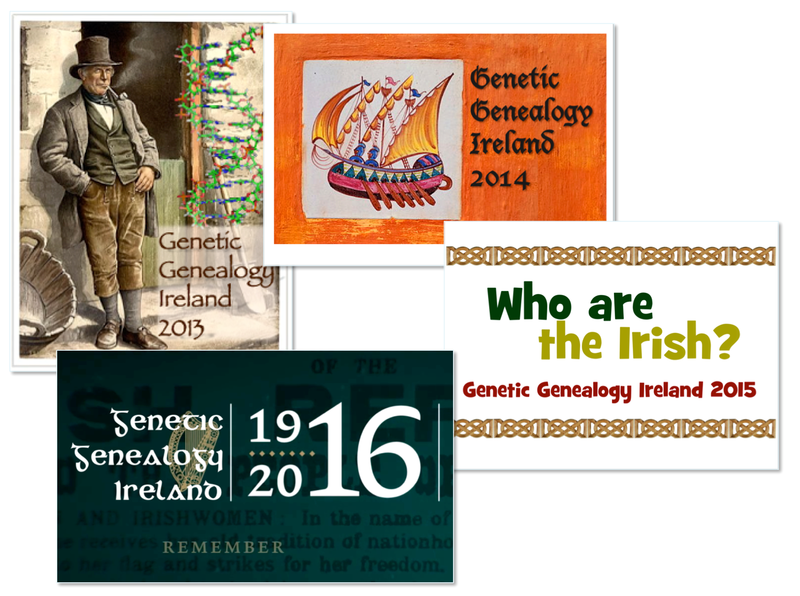 The line-up of speakers for Genetic Genealogy Ireland 2017 were announced today. This is the fifth year of the annual genetic genealogy conference and the topics included in this year's series of DNA Lectures illustrates how this new science is continuing to evolve and develop at quite an amazing rate. There are many new speakers at this year's conference, and this in itself will keep it fresh and engaging. Each day will start off with an overview of the basics of DNA testing and how it can help your genealogical research. This year we welcome two new speakers to this slot - Ann Marie Coghlan from the Cork Genealogical Society and Donna Rutherford, who runs the Facebook group "DNA help for Genealogy". They will join Michelle Leonard who wowed audiences last year with her wonderfully straightforward and easy to understand presentation on how DNA can help your family tree research. Now that DNA testing is becoming more commonplace, many more people need help interpreting their results. And to help them with their Y-DNA results, John Cleary and myself each have a presentation in this regard. In addition, James Irvine will be using the example of his own individual Surname DNA Project to illustrate what a powerful tool Y-DNA can be in researching your surname. We also are privileged to have Dave Vance from the USA speaking about his SAPP Programme which is a fantastic piece of software that will help surname project administrators generate Mutation History Trees from the data in their projects. In effect, this will help us build family trees for entire surnames, from their origins to the present day. For the interpretation of autosomal DNA testing, we have a selection of atDNA aficionados including Paddy Waldron (Clare Roots Society), Debbie Kennett (author & blogger), and (all the way from the USA) Roberta Estes, who writes the world-renowned blog "DNA Explained". We also welcome back Peter Sjölund (ISOGG, Sweden) who last year gave a very popular talk on Viking DNA and its links with Ireland. This year Peter will be discussing "The Power of mitochondrial DNA" and no doubt will be using some of the excellent examples from his own Swedish genealogical research. You can see Peter's excellent talk from GGI2016 on our dedicated YouTube Channel here. We also welcome back Margaret Jordan, also of the Cork Genealogical Society. Margaret spoke at GGI2013 and it will be great to have her back to discuss the current status of the Ireland Y-DNA Project (currently over 7600 members strong, making it the largest Irish genetic project in the world). Margaret's talk will nicely complement the much anticipated presentation of the (almost?) final results of the Irish DNA Atlas project. This is a joint collaboration between the Royal College of Surgeons of Ireland and the Genealogical Society of Ireland. Over 200 subjects have been recruited from all over Ireland and their autosomal DNA sampled. Each participant must have 8 great grandparents born within a relatively strictly defined geographic area. As a result, the study gives us a snapshot of autosomal DNA in Ireland from about 1850, just after the Great Famine. Ed Gilbert has tantalised us with snippets of information and updates on the projects progress over the past 2 years and we look forward to welcoming him back for this exciting climax. In addition to Ed's talk, Professor Gianpiero Cavalleri (who heads the Irish DNA Atlas team at the RCSI) will present on the results of an associated part of the study, namely the DNA of the Irish Travellers. The results of this allied study were published by the team earlier this year in the journal Scientific Reports (a Nature Publishing Journal). We also have an array of international academic speakers included in this year's event, and a big thank you has to go to Professor Dan Bradley (Trinity College Dublin) for facilitating this. Dan will be giving us another exciting update on the ongoing work of his ancient DNA lab, including the results from additional analyses on neolithic genomes. Another member of his team (Eppie Jones) will be speaking about ancient hunter-gatherers in Ireland. And we are delighted to welcome two new speakers to GGI2017 - Professor Gisli Palsson from the University of Iceland, and Professor Hannes Schroeder from the Natural History Museum of Denmark. Gisli will be talking about the genealogical database The Book of Icelanders and the DNA testing of the people of Iceland, how these have helped reconstruct the genome of a runaway Caribbean slave who became an Icelandic merchant in the early 1800s, and the quest of his descendants for roots and identity. And in an allied talk, Hannes will be discussing the work of the EUROTAST team which is exploring the genetics of the Trans-Atlantic Slave Trade. There is lots to see at this year conference and I am very much looking forward to the privilege of chairing the event. See you in Dublin in October! My mother was a McDonald and I assumed she was Scotish. I had a male McDonald tested and he intered the Clan Donald Surname Study, They said test a certain marker to see if he was descended from Niel of the Nine Hostages. Is this a normal marker tested or one that is not covered in the normal Y test? I had the Big Y and I am I-A5475 (Viking). The Y-DNA-37 test is the standard STR marker test that most people start with. From this, one can predict what SNP marker the person will test positive for. The SNP marker associated with Niall of the Nine Hostages is M222. This is a separate test and is covered by the Big Y test, several of the SNP Packs (e.g. R-M269 Pack), and of course the single SNP marker test M222. Any idea what topics Saturday will cover? The current plan is to have a beginner's session, a session on interpreting your Y-DNA results, another on how to build Mutation History Trees from Y-DNA data, a session on Triangulation and how to focus your DNA research on a particular ancestor, a session on the 9 atDNA tools offered by FTDNA to break thru your Brick Wall, and a session by Peter Sjölund on how to harness the power of mitochondrial DNA. Many thanks Maurice, sounds very interesting. Any idea when a full timetable of DNA lectures will be available? I am flying to Ireland to attend Saturday and Sunday.